As you plan to tickle the senses for your child’s upcoming Glow in the Dark birthday party, you want everything to be perfect. From the decorations to the games, you’re planning every detail to make this occasion extra special for your pride and joy. Don’t forget to have fun with food as well. When it comes to having a good time at any gathering, food is usually at the heart of it and parties for kids are no exception. Think outside of the box and create some childhood memories to last a lifetime with these great treats that will be a hit as they glow under the black lights. To make a tantalizing treat for the taste buds that will glow, begin with a box brand of cupcakes or a favorite family recipe. The main difference is going to be in the frosting. Your frosting should begin with a white base. You can buy one or use a recipe that is based on confectioner’s sugar. The trick is in using neon food coloring and gelatin. Get orange or green gelatin for the right effect. Put your frosting in a bowl and add neon food coloring that complements your gelatin. Frost your cupcakes and freeze them. You’ll prepare your gelatin by adding a cup of boiling water, topped off by three tablespoons of chilled tonic water. After your cupcakes have been in the freezer for an hour, dip the tops in the gelatin and freeze them for several minutes. You won’t believe how they’ll glow under a black light! For another great detailed “How-To” article on Glow in the Dark Cupcakes, check out Hoosierhomemade.com! Kids love to have jello that has been cut out with cookie cutters and you can find all kinds of creative shapes to go with your party theme. Make this treat glow and everyone will be over the top. Follow the recipe on the box for the boiling water. When you add the cold water, make half of it tonic water and you’ll have a glowing concoction! Add Tonic Water to clear sodas or lemonade and place it under the black lights to have an absolute sensation. If you’re worried about it affecting the flavor, you only need a little to create a dazzling effect. Be sure to use clear cups so they can marvel at their glowing drinks with every swallow. Carry on your theme with a glow in the dark sundae station and let the kids make magic themselves as they create their concoctions. Begin by blending your vanilla ice cream with a little bit of tonic water and freezing it to get a firm consistency. From that point, choose a variety of candies and toppings that really bedazzle under the black lights, such as neon sprinkles, neon fruit snacks, and other treats. Top it off with a glow stick that pokes up out of the middle and you’ll have all of the kids talking about their treats for days. Everyone’s faces will be glowing with smiles. Tonic Water – the secret Ingredient for glowing food! What is tonic water and where can I get it? Tonic Water is a carbonated beverage that contains a little bit of Quinine, a naturally occurring substance. The Quinine is the ingredient that is reactive to Ultra Violet light. Quinine was originally used hundreds of years ago as a medicine but today is used mostly for flavoring in mixed drinks. Tonic Water will not affect the flavor of your Glow Party Treats and is completely safe to consume. Fortunately, not much is needed for the glow affect as it can be a bit pricy. But the effect is well worth it! It can also be found at your local grocery store in the liquor section (it is nonalcoholic). I love the tonic water idea! I hope it works. 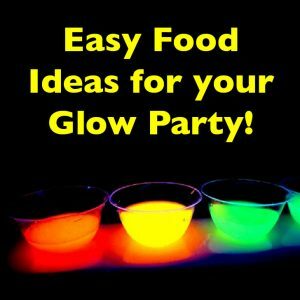 I can’t do any food die (coloring) in my food, do you have any ideas for a non-food coloring neon glow in the dark party? Thanks i love it! do you have to have a blacklight for it to work? Yes – generally, most food that glows only glows under a black light. Do you have to have DIET tonic water for it to make your beverages glow? No, not at all! It can be regular tonic water. Anyone ever heard of GloChiProducts.com just add my daughters birthday party and the cake cake out great. The product I used was FoodGlow all natural Ultraviolet Blacklight #GlowInTheDark food additives. Buying tonic water or crushing a bunch of riboflavin pills created a hassle for the creative part when making her birthday cake. FoodGlow was easy to use and safe, I recommend this product for any baker that’s looking to have a uv blacklight party. Does the tonic water glow lose its effect over time? As in can I make these drinks and fun snacks the day before and still have them glow brightly? Yes. For most cases, a black light is required for food to glow. Glowinthedarkpartyideas.com is a participant in the Amazon Services LLC Associates Program, an affiliate advertising program designed to provide a means for sites to earn advertising fees by advertising and linking to Amazon.com.